Those DPs are business as usual in Summer for many similar latitudinal locations in the northern hemisphere . Almost a month now and Badgery's Creek still offline. Is it coming back? Anybody know? Seems a bit strange. Maybe it's part of the earthworks at the new airport? Those DPs are business as usual in Summer for many similar latitudinal locations in the northern hemisphere. Really? Like where? The only place I can think of would be Florida due to the Gulf Stream. Does look to be a somewhat humid stormy heatwave unlike the typical dry ones we get this time of year. Wouldn't be surprised if we get more sea foggy days either, the SST anomalies have spiked up to +4C just off the Illawarra. WZ forecasting DPs of 23-24C during the peak of the heat for coastal SYD. Will get pretty uncomfortable. The only real benefit those anomalies will have is for places like the South Coast if we have days of ese/se’erlies otherwise they’re useless that far south. If they were more e/ene/ne then they’d pump bucket loads into approaching troughs. Atlanta, GA (34° N), for instance; easily more humid on average than Sydney. I think most of Japan gets those high DPs due to being surrounded by water, also Eastern Coastal China, for example Shanghai often gets DPs in the low-mid 20's. Along with Florida, most of Eastern USA gets very humid during summer, especially July and August. However temps above the high 30's are very rare there, unlike in Sydney. Even as far north as New York dew points rise into the low-mid 20's quite often in late summer. Mediterranean cities such as Beirut have very high DPs as well during summer, however virtually rainless. Also Buenos Aires gets fairly high dew points as well (and plenty of severe storms). Looking pretty humid here on the Central Coast for the next week. A dew point of 28°C is forecast for Gosford next Friday. America is very lucky in that sense they are surrounded by two very warm regions that pump ample moisture. They have the shallow gulf of mexico and the gulf stream right next to it. Meanwhile Buenos Aires doesn't have such a warm ocean near it they have ample rainforests and forests north of it which create their own moisture feed. On the note of heatwaves EC is predicting some amazing dew points for elevated areas Katoomba at a dewpoint of 22 degrees and Kangaroo valley at 24 degrees. This recent rain would have certainly contributed to these dewpoints and the lack of westerlies adds to it. I wonder if any wet bulb records would be broken. Also could someone explain the concept of Wet Bulb temperatures, its a bit confusing personally. So massive CAPE figures and good LI's next week, but very little interest in storms at least from GFS. Must be some hefty capping expected, otherwise you would think that storms along the Seabreeze boundary would be likely? I Doubt it GR it's very likely that the CAP will be extremely strong with a lot of heat pouring mixing in at higher levels. Which prove to be a very strong cap, although EC has been indicating that storms will happening on isolated areas on the tablelands which would somewhat escape the capping. Take a look through Tokyo's summer weather, like August 2010 for example, when the dew point was hardly ever below about 23C even on the hottest days. It's like that pretty much all over Japan and Asia even up to Beijing, and in North America even up to the Canadian border (due to the Gulf of Mexico). It looks like a five day Heatwave starts Tuesday. I'll start a heat thread in the next day or two unless someone else wants to. Penrith is forecast to get four consecutive days of 41+ stating Wednesday 16th. Even OH is forecast to get five consecutive 31+. A 'courageous' forecast as this rarely happens. Seabreezes will moderate coastal temperatures until the last day of the event (which currently looks like the 19th). 850 temps over Sydney reach 28 mid week. Meanwhile, tomorrow's Sydney forecast makes no sense. Cloudy, 20 km/h Southerlies and 27? It'll get to 27 if there are lengthy sunny periods. 850 humidity and soundings aren't showing as much cloud as the three recent cloudy days when it couldn't get past 22 apart from bonus additions. Yeah Canberra will get it's fair share of the heat too, always does this time of year, typically early Feb is the peak time for the heat. I guess time will tell if our all time record of 42.2C will be broken on Wednesday or not. Looks like a genuine heatwave starting on Tuesday, at least 4 days in a row over 40C in western Sydney and the Hunter. Definitely a new thready worth event Steve. The Upper Hunter, Singleton going for 3 x 43C days, and even 44C in Scone. Looks like the normal weather we get in the 2nd half of Jan, which tends to peak around Australia Day to early Feb.
Forecast for Katoomba from Monday onwards is downright ridiculous. Mt Boyce is already running an avg max of 26.4C, 3C above the long term avg for Katoomba (Mt Boyce would actually be a touch cooler on avg than Katoomba). May end up being the hottest month on record if next week comes off and the weather doesn’t switch to rain and SE’lies to cap the month off. Sad times for much of the fragile ecosystems in that part of the world. I was woken by the Southerly around 3:30 this morning. It is still reasonably brisk, around 15 - 25 knots (not km/h) near the coast. It was 100% overcast here for most of the morning, but the Sun and the cicadas are starting to come out now. The BOM just updated the forecast to "Mostly cloudy, though sunny breaks at times" and still going for 27/32 for Sydney and Penrith. I think that would take a bit more sun than the forecast implied to get there. 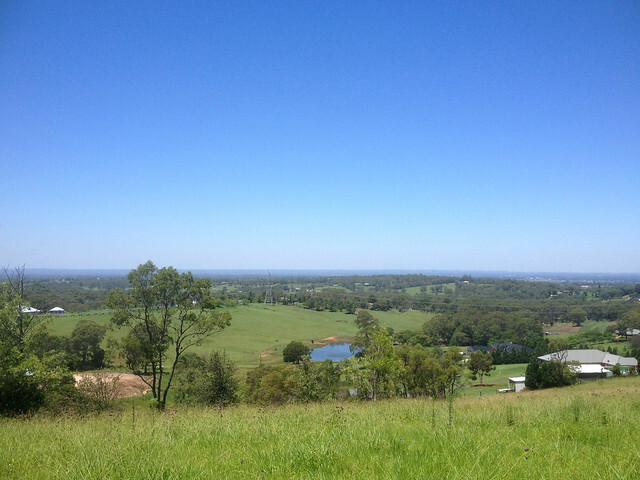 I was in the Hawkesbury district yesterday. It was sunny and humid with small convective clouds trying to get going, about 35 degrees on the car thermometer. Everything is looking very green after Spring and Summer rains. Dams look full or nearly full. Pughs Lagoon near Richmond is back to its normal level, the sandy beaches that appeared for a while now covered. Even OH is forecast to get five consecutive 31+. A 'courageous' forecast as this rarely happens. Seabreezes will moderate coastal temperatures until the last day of the event (which currently looks like the 19th). 850 temps over Sydney reach 28 mid week. The forecast for Sydney might not necessarily be Dawes Point \ Obs Hill. I know from years of working in the city that you only have to go a couple of blocks away from the harbour foreshore to experience higher temps. Barangaroo & Darling Harbour feel decidedly warmer\hotter when the ENE breeze is blowing (as opposed to a gradient ENE wind). We've done this discussion to death but I always consider these 'courageous' forecasts to be a better representation of what you feel in the city. Meanwhile the Obs Hill site has reached the forecast 27 in sunny breaks and under the influence of one of the few wind directions where it is not exposed to the water. Yes Steve I've noticed how green Western Sydney is at the moment. During July Everything was yellow and rough, but given 4 months of above average rainfall. Everything has turned beautiful and lush haven't had to water anything at all as well. Hence probably why this heatwave will be pushing our comfort levels. Check out windy.tv GFS 2pm at Musswellbrook. 49c.